Even in the best organizations, bias is an unavoidable fact of life. What sets the best organizations apart, says one leading national expert, is their commitment to mitigating bias. It’s an approach that helps maximize organizational performance and sets the stage for success over the long term. “There is a strong business case for diversity and inclusion,” says Dr. Stefanie Johnson. “For any organization, the question is not whether bias exists — it’s what you’re going to do about it. If your objective is to hire the best people and your entire organization supports that, then you’re going to have a diversity of thought and perspective that will result in better outcomes. Johnson’s lecture is being presented by the Athena Collective, a group that provides training, support and a point of connection for women in Birmingham’s business and entrepreneurial ranks. The event, at the University of Alabama at Birmingham’s Hill University Center, is free to the public, as is a post-lecture panel discussion that will be held immediately afterward at Good People Brewing Company. “This is a passion project for us,” says Whitney Wright, co-founder of the Athena Collective and director of investor relations at Cook & Bynum Capital Management. “Birmingham has a tremendous opportunity right now, as we’re beginning to see the emergence of an innovation economy. As that happens, we’re trying to be a catalyst for inclusive economic growth, to make sure that’s part of the DNA from the get-go. The event is being sponsored by UAB and Bronze Valley, an organization launched in February with the mission of creating an education-to-opportunity-to-outcome pipeline for those currently underrepresented in technology careers, as entrepreneurs and in other fields where innovators will lead the way in creating the jobs of the future. Neill Wright, executive director of Bronze Valley, says the “Breaking Bias” message complements his organization’s mission and objectives. Emily Wykle, organizational development manager at UAB, notes the university’s commitment to inclusion is reflected in part by the fact that its student body — as well as the faculty and staff — rates as one of the most diverse in the United States. She says sponsoring events like “Breaking Bias” is important in terms of management and leadership development, particularly to the extent that they help deepen the local conversation around the issue at hand. 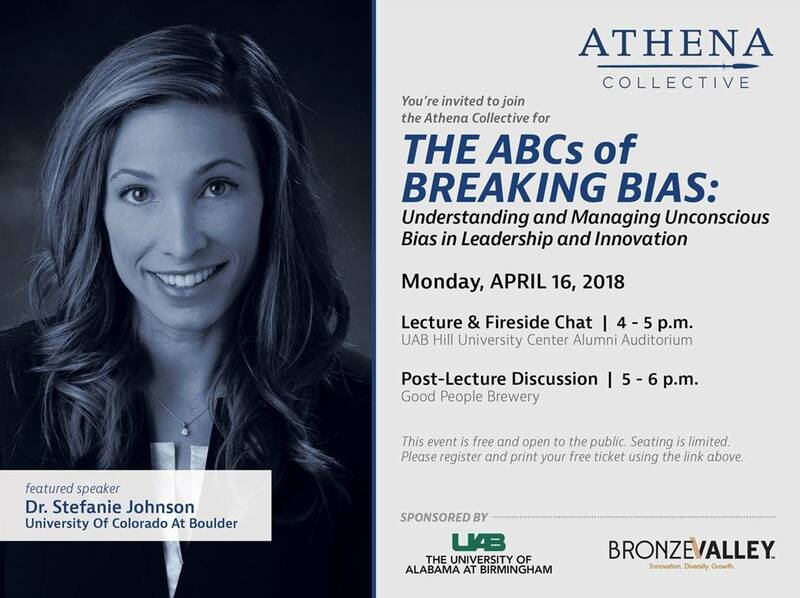 “The ABCs of Breaking Bias” is scheduled for Monday, April 16. Dr. Stefanie Johnson’s lecture will begin at 4 p.m. at the UAB Hill University Center’s Alumni Auditorium, located at 1400 University Blvd. The post-lecture discussion will take place from 5-6 p.m. at Good People Brewery, at 114 14th Street South. The event is free and open to the public. Seating is limited. Those interested in attending can register and print their tickets by following this link.